Sharp and strong memory is a natural desire of every person. Either you are a student, a professional or an aged person, poor memory is quite annoying for all of you. Weak memory or memory loss becomes a serious problem when it interferes with our daily activities. Before we proceed to natural solutions for weak memory, first let's have a look on main causes behind poor memory. 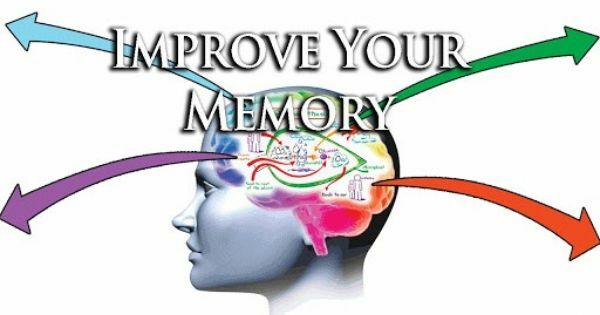 However, to boost your memory you can follow given tips which will definitely help you to enhance your brain memory. Antioxidants protect brain tissue by breaking down free radicals, which are toxic forms of the oxygen molecule naturally found in the bloodstream. Vitamins C, E, and beta carotene are powerful antioxidants and very important vitamins for memory. These vitamins can be found in naturally occurring foods such as blueberries, strawberries, and other berries; sweet potatoes, red tomatoes, spinach, broccoli, green tea and other types of tea, nuts and seeds, and citrus fruits such as oranges and grapefruits. Many scientific researches has proved that omega-3 fatty acids are particularly beneficial for brain health and memory. Omega-3 fatty acids are found in wild-caught, deep sea fish (wild salmon, tuna, mackerel and herring). Other important sources of omega-3 fatty acids include walnuts(Akhrot), ground flax seed, flax seed oil, pumpkin seeds, and soybeans. Almonds(Badam) are considered very effective to restore a poor memory. Soak 7 almonds in water overnight. Remove the skin and consume with a glass of lukewarm milk. Repeat this daily to enhance your memory. Take equal quantities (about 250g) of almonds and fennel seeds(saunf). Grind them to make powder and store this powdered mixture in air tight jar or bottle. Daily consume 1 tablespoon of this mixture with 1 glass of lukewarm milk. Repeat this daily and observe a noticeable improvement in memory even within few days. Walnuts(Akhrot) are regarded as best dry fruit to enhance brain power not just because of their resemblance to human brain but due to their exceptional role for enhancing brain power. Walnuts are very useful for boosting your memory. 20g Walnuts along with 10g dried raisins act as best home remedy for weak memory. Grind 4-5 black pepper seeds and make with 1 teaspoon of honey. Consume this daily to help improve memory and concentration. B Vitamins improve memory by creating a protective shield for the neurons in the brain. B vitamins break down homocysteine, which is an amino acid that is a toxic poison to nerve cells. The most important B vitamins for memory include B6, B12, and B9(Folic acid). You can increase the B vitamins in your diet by taking vitamin supplements and by consuming fresh natural foods such as spinach and other dark, leafy greens; broccoli, asparagus, strawberries, melons, black beans, leeks, and other legumes, citrus fruits such as oranges and grapefruit, and soybeans. Drink at least 8-10 glasses of water daily because 85% of brain tissue is water and lack of water or dehydration can affect the function of brain cells and may result in poor memory or memory loss. Make time for friends and family members and have some fun because smiling and laughters involve multiple regions across the whole brain and have positive effects on brain cells and help a lot to increase memory. Try to adopt a habit of regular exercise because it increases the supply of oxygen to your brain and reduces the risk for disorders that lead to memory loss. Besides increasing oxygen supply, regular exercise also encourages the production of new brain cells. (i) Avoid Alcohol because it adversely affects on brain cells and results in poor memory. (ii)Avoid smoking because it harms memory by reducing the amount of oxygen that gets to the brain. Studies have shown that people who smoke find it more difficult to put faces with names than do nonsmokers. (iii)Reduce the stress level because it also has adverse effect on brain cells. Being stressed or depressed can make it difficult to pay attention and focus, which can affect memory. Stress caused by an emotional trauma can also lead to memory loss. (iv)Proper sleep of at least 6 - 8 hours is essential for proper functioning of brain cells.